Italian promoters Roundzero have two events lined in June. 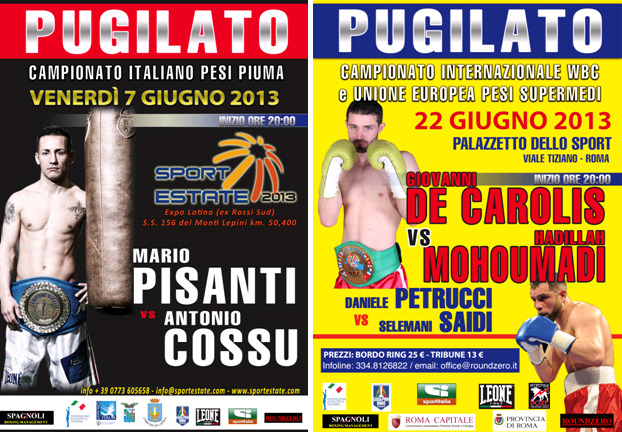 In the first, June 7 at the Expolatina in Latina, national feather champ and local man Mario Pisanti, 12-1-1, defends the title against his official challenger Antonio Cossu, also 12-1-1, from Sardinia. This show is part of the Latina Sport Summer 2013 and will be televised by Sportitalia. On June 22 in Rome, supermiddles Giovanni De Carolis, 20-4-1, and Hadillah Mohoumadi, 14-3-1, clash for the EU and WBC Int´l titles. In the co-feature jr middle Daniele Petrucci, 30-1-2, take on Tanzanian Salemani Saidi. The WBC have approved that welters Patrick Bogere and Patrick Allotey clash for the WBC Int´l Silver title over ten two minute rounds and with ten ounce gloves. The fight goes ahead June 14 in Stockholm and is the co-feature of Frida Wallberg´s defence of the WBC jr lightweight title against Diana Prazak that is also set for 10x2. The fight was first set for 8x3 but this distance was nixed by the Martial Arts Delegation, who however gave special permission for the historial - in male boxing that is - 10x2. Ten ounce gloves in all weight divisions is another Swedish speciality all in accordance with interpretation of the Martial Arts Legislation where "acceptable safefy for the participants" is a key sentence. A standard professional boxing match in Sweden is still only allowed for 12 minutes. The Swedish Federation have appealed the decision from the Martial Arts Delegation and a final decision is expected in a few days - but it´s noteworthy that the glove issue is not included in the appeal. Bosnian heavyweight Adnan Buharalija fought Mark De Mori May 17 in Croatia - needless to say it was a titlefight - and was stopped in six. Three (3) days - May 20 - later Buharalija fight in Belgrade and was stopped in two by Serbian Jovo Pudar - and this was Adnan´s third loss by stoppage in 2013 - and in 2012 Buharalija, who´s total record is around 26-18-2, was tko´d or knocked out five times (of course one of the fights was for a world title). The EBU have had its members sign a Safety Agreement in an attempt to create unified suspensions like the ABC in the US but after a promising start the agreement have fallen apart piece by piece. There´s now also several "pirates" working outside of the EBU. On the EBU meeting June 1 the issue will again be brought up and a new version of the Safety Agreement will be launched and this time maybe with stronger support but the problem with the federations working outside of the EBU will probably remain. There´s also the problem of fighters on the Suspension List in the US that travel to Europe and fight such as Oliver McCall did recently and that is also a delicate issue that needs to be looked into. May 25, Hamburg, GER, Sporthalle, bdb? Clear win for Rahimi in sole profight on a martial arts show. 96-93, 97-94 and 98-90. Gavern had a point deducted in the seventh for hitting on the back of the head but hurt and floored Maskaev in the ninth. 60-54 on all cards, Gaoma was cut after an accidental clash of heads and it got worse and had to be stopped with Meryasev well ahead on points. Papazov was rocked in the fourth but wore down Ayvazidi who was retired by his corner. The Swiss Federation recommends 28 suspension for Zsalek. WBU title - but who recognizes the Malta Boxing Commission?? Gökmen only recognizable name on the bill. Takam won the WBFed title by stopping the faded Grant in the eighth. 80-70 twice and 79-71. Jomardashvili was down in the fourth and eighth. 49-46 and 49-47 for Nguema and 49-46 for Tamisier. this bout is on the poster but apparently never happend. sole profight on a MMA/kickboxing event. May 24, Zakopane, POL, Bigger is Better, Hotel Mercure Zakopane Kasprowy, sanctioning body?? Ilie too smart for Suda - but out of shape. BiB reports Suda as winner? ?